First lady Michelle Obama was introduced by Aissatou Hamidou Diallo, 13, from Burkino Faso, at the White House on Tuesday. The reception marked the 100th anniversary of International Women's Day. But first, a report on the state of women and girls in the United States. DOUG JOHNSON: March is National Women’s History Month in the United States. It is a time to recognize, honor and celebrate the important part that women play in shaping America’s history. It is also a time to call attention to the social, political and economic problems facing women and girls. Faith Lapidus has our story. FAITH LAPIDUS: Earlier this month, the White House Council on Women and Girls released a historic report on the condition of women in America. It is the first time since nineteen sixty-three that the government has released such a detailed report on the subject. The report says women have made major progress is several important areas. But, it says, there is still much work to be done. Women today are more educated, have better jobs and earn better pay than at any other time in history. There are also more women than men graduating from high school, enrolling in college and attending graduate school. In fact, women are expected to represent nearly sixty percent of all college undergraduate enrollment by the year twenty nineteen. All of these advances represent major progress for women. However, the White House report also noted some serious problems. For example, female workers continue to be paid less than male workers. The report said that in two thousand nine women at all educational levels earned about seventy percent of what men earned. Women were also more likely than men to live in poverty. This was especially true for unmarried women with children. Twenty-eight percent of this group had income levels that were below the poverty line. President Obama noted such inequities in his Presidential Proclamation for Women’s History Month. Mr. Obama said countries are more peaceful and successful when their female citizens enjoy equal rights, equal voices and equal chances for success. He also said the United States must lead by example in protecting women’s rights and supporting their empowerment. Women are fifty-one percent of the total population in America. National Women’s History Month grew out of National Woman's Day which was first celebrated in the United States in nineteen hundred and nine. The observance was celebrated worldwide as International Women’s Day in nineteen eleven. Congress expanded it into a month-long celebration in the United States in nineteen eighty-seven. This year’s National Women’s History Month celebration is called “Our History is Our Strength.” Programs and ceremonies are planned around the country to celebrate women’s successes. DOUG JOHNSON: Our question this week comes from Thailand. Kitichai asks about the career of Michael Jordan, his favorite American basketball player. Michael Jordan is widely considered the greatest basketball player of all time. He is most famous for playing for the Chicago Bulls, but later in his career he played briefly for the Washington Wizards. Michael Jeffrey Jordan was born in the Brooklyn area of New York City in nineteen sixty-three. He went to high school and college in North Carolina. He played basketball at the University of North Carolina at Chapel Hill. He was chosen to play for the Chicago Bulls in nineteen eighty-four. Michael Jordan played for the Bulls for thirteen years. During this time, the team won six championships. Jordan became one of the highest scoring players in the National Basketball Association. He averaged thirty points a game during the regular season. He was recognized as the NBA’s most valuable player five times during the regular season. Michael Jordan became famous for the way he jumped through the air to throw the ball into the net and score points. This skill earned him the nicknames “Air Jordan” and “His Airness.” Jordan also became known around the world for appearing in advertisements for companies including Nike, Gatorade and Coca-Cola.Michael Jordan also won gold medals in nineteen eighty-four and nineteen ninety-two representing the United States basketball team during the summer Olympic Games. Jordan retired from the Chicago Bulls in nineteen ninety-four to play minor league baseball for one season. He retired from the team permanently in nineteen ninety-nine. He played briefly for the Washington Wizards starting in two thousand one. In two thousand six, Michael Jordan bought a minority ownership in the Charlotte Bobcats professional basketball team. 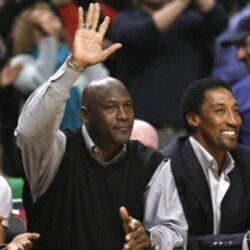 In two thousand ten, his company, MJ Holdings, reached an agreement to buy the team from the Bobcats’ majority owner. Last March, Michael Jordan became the first former National Basketball Association player to be majority owner of an NBA team. DOUG JOHNSON: British singer Adele’s new album has taken first position on Billboard Magazine’s Top Two Hundred Albums chart in its first week. Her recording “21” now is headed into its second week at number one. The smoky voiced twenty-two-year-old sings about heartbreak on her new album. Bob Doughty plays some of the new songs. BOB DOUGHTY: Adele recently told a reporter that she has not healed from the end of the relationship she sings about in “21.” She laughed and said she would not recover until she fell in love again. DOUG JOHNSON: I’m Doug Johnson. Our program was written by June Simms and Caty Weaver who was also the producer. If you have a question about American life, write to mosaic@voanews.com. We might answer your question on this show. So please include your name and country.